The 979-2 Miter Trim Saw cuts casing for doors and windows at rates up to 25 pieces per minute. The blades saw down through the face of the casing to eliminate tear out on the face. 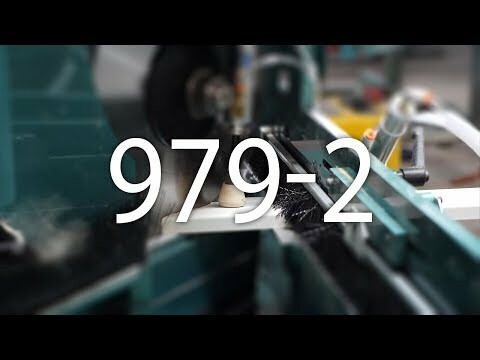 The 979-2 features chip out support below the saw to prevent deflection in thin casing as the saw passes through it: this is especially important when cutting MDF or pre-finished casing. The 979-2 can miter side casing with a 90 degree trim on the bottom, up to 98” long on the short side of the miter. Head casing, mitered on both ends, can be cut as short as 12&frac38;” measured on the short side. The feed hopper may be easily adjusted to accommodate material up to 4½” wide and up to 1¼” thick. Touch screen selections allows the operator to quickly change the saw head between 45 degrees and 90 degrees, while heavy duty stops ensure the accuracy of the angle setting every time. The distance between the saw blades is controlled with by Beckhoff touch screen with presets for all popular casing and door stop lengths. A Beckhoff controller and servo motor drive a precision ball screw to position the moving saw carriage with near perfect repeat accuracy. 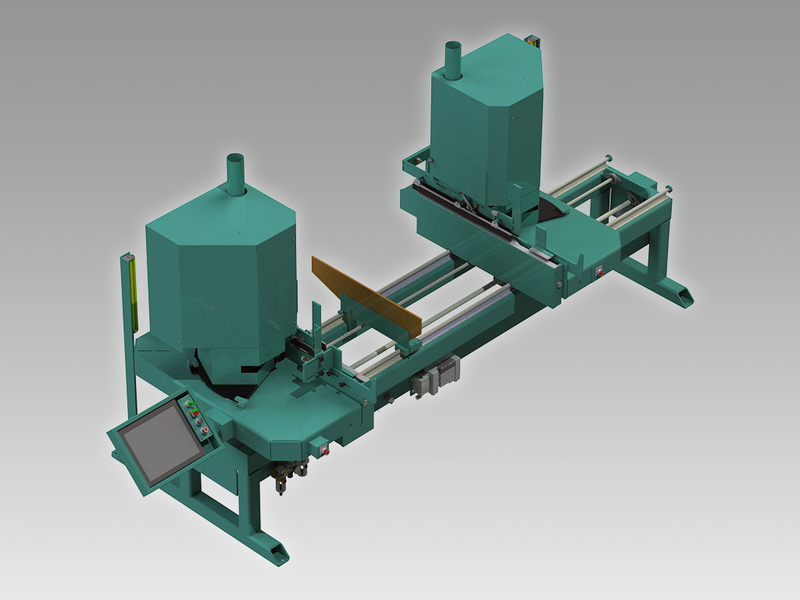 The system also automatically compensates for the offsets when the cutting heads are switched between 90 degrees and 45 degrees. The operator can also enter exact quantity of pieces to cut on the touch screen when cutting to job order. When the entered quantity is cut, the feed system will automatically stop. For custom length casing , the touch screen’s numeric keypad can be used to move the saw anywhere within it’s range of travel. Safety features include automatic shut-off while machine is not in use as well as the use of a safety light curtain. The safety light curtain ensures the machine cannot be in operation while personnel or objects are near the moving blades.